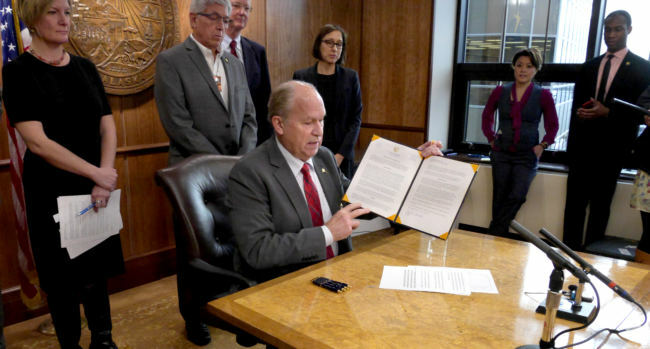 Governor Bill Walker today announced the 20 members of the state’s new climate change task force. The team’s job is to come up with recommendations for how Alaska should deal with climate change. It was created by Walker in an administrative order issued this fall. The task force is led by Lt. Governor Byron Mallott. Alaskans representing a wide range of interests made the list. They include Fran Ulmer, chair of the U.S. Arctic Research Commission, BP Alaska president Janet Weiss and North Slope Borough Assembly chair John Hopson, Jr. The team also includes experts on renewable energy and climate science. Another notable member is 17-year-old Sam Schimmel from Kenai Peninsula and St. Lawrence Island. Schimmel is Siberian Yupik and Kenaitze Indian. “The issue of climate change is very important for Native youth because it affects our traditions — our hunting traditions, our fishing traditions, our berry picking traditions,” Schimmel said. Schimmel wants the team to tackle solutions to problems Alaska Native communities are already dealing with because of climate change so young people can keep taking part in important traditions. Six of the team’s members were part of former Governor Sarah Palin’s Sub-Cabinet on Climate Change, including Chris Rose, executive director of the Renewable Energy Alaska Project. Rose hopes the group has more impact this time around. “About ten years have passed and we’ve seen climate change accelerate. We’ve also seen the price of renewables come down tremendously in that decade, so I’m hoping that this time around, there’s a lot more action rather than recommendations,” Rose said. Rose hopes a big priority for the team will be working on improving financing for renewable energy and energy efficiency projects in Alaska. The group will meet for the first time on Dec. 18. The governor’s office wants an early draft of their recommendations by next September.